Because environmental stewardship education is central to their work, it was important to MBG that even a small restroom facility be a demonstration of sustainable practices. SOA’s design for the facility features waterless urinals, dual flush, and low flow toilets. Lighting fixtures are controlled by occupancy sensors and photocells so that lights only turn on when the building is occupied and daylighting is insufficient. The most notable and celebrated component of the building’s design, however, is its green roof. 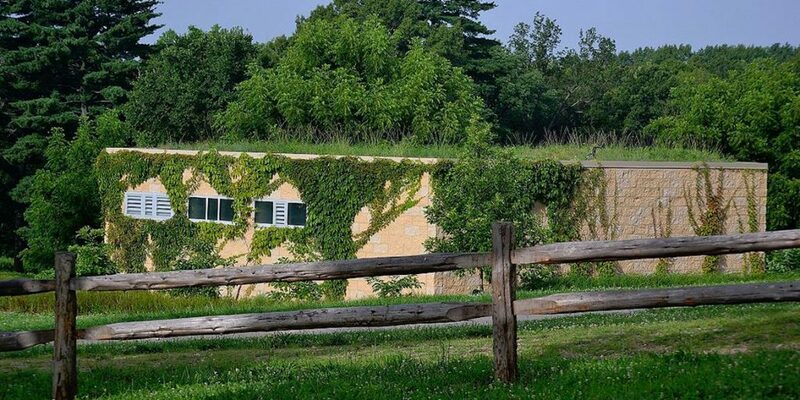 MBG developed a special blend of 33 native plants that were hand sown on the roof’s unique soil matrix. The building is tucked into the hillside, which provides natural insulation, and blends into the surrounding prairie.